As a reputed firm, we are engaged in manufacturing, supplying and distributing a wide range of Analog And Digital Storage Oscilloscope. Our range is well equipped and is offered in standard specifications. Due to the support of our diligent workforce and state-of-art infrastructural unit, we are into offering a huge range of Digital Storage Oscilloscope. The demand of our Digital Storage Oscilloscope is rapidly increasing in the market for its compact design and advance technology. Also, one can avail these products from us at market leading price. 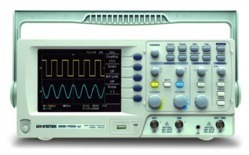 Our company is involved in providing quality assured Digital Storage Oscilloscope to the clients. The frequency bandwidth of this product ranges from the handy 20MHz to the high-class 500MHz. Moreover, up to 2M point’s memory depth and 5GSa/s real time sampling rate can pick up and hold the entire signal for preserving the accuracy. The PC interfaces such as LAN, USB, RS-232C, GPIB and Printer Port are integrated to the panel to satisfy data transmit/save needs. 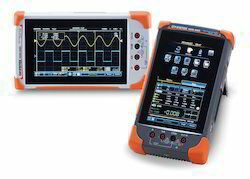 GDS-200/300 series oscilloscopes, the brand new concept compact digital oscilloscopes developed by GW Instek, introduce 7” capacitive full touch panel LCD which can be positioned in portrait and landscape display. The recharging-battery design makes the series easy to operate for field operations. The GDS-200/300 series are applicable in laboratories, R&D, large electric system tests, power product tests, motor tests, solar power battery inspection and repair, and maintenance personnel who are always on field assignments. Optional 40 MHz dual-channel differential probe can achieve equivalent isolation results for measurement system under strict power and grounding environment. Users can also easily apply the oscilloscope as a very convenient USB storage equipment to store waveform images and raw data. Additionally, the oscilloscope can be connected with smart phones to transmit the recorded data. Engineers are aware of GW Instek oscilloscopes’ thoughtful designs through diversified application software. Advanced DMM function and GO/NOGO template editing facilitate users in conducting advanced diversified measurement functions. Engineering calculator, attenuation calculation analysis, and resistance indication analysis help users apply auxiliary functions that demonstrate the concept of powerful and comprehensive technological integration. An extensive array of Visual Persistence DSO is offering by us to our esteem customers. We manufacture this Visual Persistence DSO as per the international quality norms and standards. Also, the excellent performance and advance technology of our product satisfy the customers most. For the complete satisfaction of the customers, we are providing them world class Digital Storage Oscilloscope to the customers. 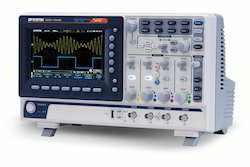 Offered Digital Storage Oscilloscope is precisely designed by our experienced professionals. Moreover, less maintenance requirement and long service life of our product increases its demand in the market. By capitalizing the skills of our technocrats, we are bringing firth technically advanced Digital Storage Oscilloscope for the customers. Offered products are highly durable and provide outstanding output due to which it is highly admired by customers. 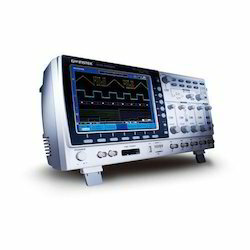 We provide this Digital Storage Oscilloscope to the customers in many specifications. To satisfy the customers completely, we are into presenting a desirable range of Digital Storage Oscilloscope. The fine finishing and smooth working of our Digital Storage Oscilloscope are highly acknowledged by customers. Also, high grade material and advance technology is used by us in the manufacturing of this product. For fulfilling various requirements of our consumers, we are providing a personalized array of Digital Storage Oscilloscope. Our Digital Storage Oscilloscope is made up of high grade material and sophisticated technology. Also, we follow international quality norms while manufacturing and testing these products. 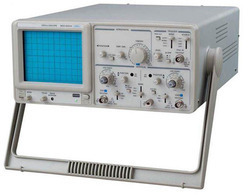 Our company is famous in the industry for providing best quality Analog Oscilloscopes to the customers. Our Analog Oscilloscopes surely and continuously plays the role of “observing the precise waveform” in the test measurement. This product is available with the frequency ranging from 10 MHz to 100 MHz and provides perfect solution when observation of an unmodified signal is required. 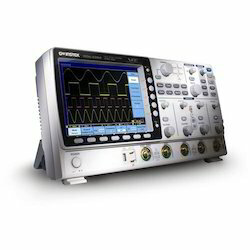 We are instrumental in offering a huge spectrum of Analog Oscilloscopes to the customers. The demand of our Analog Oscilloscopes is increasing day by day for their technically advancement and smooth functioning. Also, we keep client’s demands and requirement in our mind while developing the range. GSAS Microsystems is an authorized distributor for oscilloscopes from GW Instek, which provides an entire series of oscilloscope solution, comprised of four groups: Digital Storage Oscilloscope, Analog And Digital Oscilloscope, Real Time/Digital Storage Oscilloscope, and Logic Analyzer. 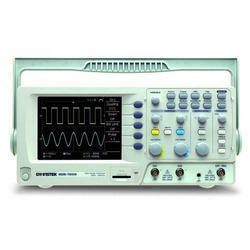 A huge assortment of Analog Oscilloscopes are providing by us to our customer at most feasible rates. 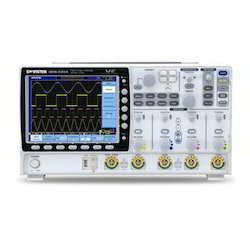 Offered Analog Oscilloscopes are highly demanded by customers for their advance technology and less maintenance requirement. The manufacturing process of this product is done under the supervision of our trained technocrats.